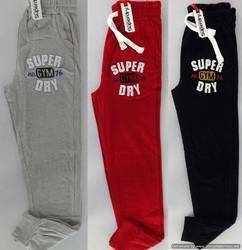 With the assistance of our diligent and enthusiastic team of personnel, we are able of offering a huge assortment of Branded Track Pants. The weight of the provided fabric in track pants is 240 gsm. We have five exclusive colors with varying size from M to XL in this product. Fabricated using the high-grade Loop Knit fabric. In addition to this, our clients can avail this pant from us at market leading prices. Looking for Branded Track Pants ?